The Stirling Society was founded in January 1997, membership is invited from anyone with an interest in Hot Air or Stirling Engines. An occasional newsletter is sent to all members. The Stirling Society does not have formal meetings as such, however members attend and exhibit at model engineering and vintage machinery shows in Britain. We have an annual get together for members in April, for the past 10 years this has been held at Kew Steam Museum, London. Note: Please be aware that the Stirling Engine Society is a separate independent organization. We will ensure you are signed up to a 1 year subscription. 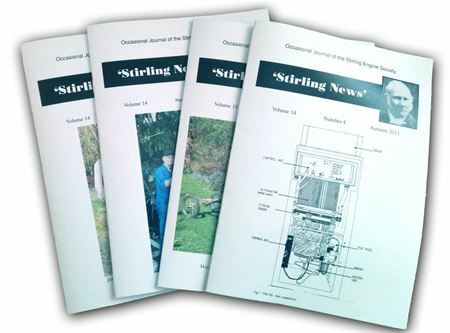 After that newsletters will be send directly from the Stirling Engine Society. We do not make and profit in anyway. 100% of the payment gets passed to Stirling Engine Society. For membership in the EU click here. For membership to all other countries click here. The FedEx delivery option is not available for the newsletters. You can still use the fedEx option if you are buying an engine as well.